A friend of mine had to make a basic game for his XNA class in university, and wanted me to do the music. Since I had just started looking into SunVox, I thought it would be cool to use sunvox.dll to play the songs directly. Right now, the library can buffer sound effects to memory (for instant playback) or render/stream sunvox files directly using sunvox.dll. Some of the approaches are a bit hackish (especially the SFX buffering method) but it works! Since that was all he needed, I don't think I will be doing any more work on this in the near future. In case anyone else would like to pick it up, I tried to keep it neat and tidy... a new experience for me, hehe. Last edited by tripflag on Tue Jan 27, 2015 8:21 am, edited 5 times in total. If you launch the newest version (006 as of now) and click "Instrument Listener", it will show an amplitude meter monitoring the kick-drum in the song. This will be implemented as a proper signal once I have the idea working correctly. One problem is the latency (which is pretty annoying since it's for a game), but I'm more worried about the seemingly random amplitude levels read from the scope. I have absolutely no idea why it seems to miss the start of the drum-note sometimes, even though it polls every milisecond. Does anyone have an idea on how to lower the latency, and how to improve the accuracy? It would be amazing if I could somehow read the amplitude half a second ahead in time so the game would have ample time to work out the response. I realize this could all be done currently with a ghost/dead-end generator playing the drum track a few rows early, but it feels kinda...hackish. As a fringe benefit, the C# binding is now a proper DLL file ready to be dropped in anywhere! What if stuff in the game could blink in beat with the music? 1) Use sv_get_current_line( slot ) to get current song playing position, and just sync some animation with this number. 2) Use sv_get_current_signal_level( int slot, int channel ). 3) Use sv_get_module_scope() like in sunvox_visual.pixi code. Audio data from this function will be synchronized with the main Audio output. But if it is not, be sure that you scope reading code is correct (like in sunvox_visual.pixi). Also if you use sv_audio_callback(), be sure that it gets correct latency and out_time parameters. I'll get back to this after a quick christmas vacation, posting updated source as soon as the signal stuff is in place! EDIT: Alright there we go, proper signals are in place and everything seems to work well enough. There's three (technically 4) ways to hook into the module listener now; added some guidelines to the listener form to explain which you'd want to use when. Good luck devs. Is anyone aware of an actively developed C# wrapper for SunVox.dll? I'm looking to use it for the upcoming Ludum Dare which, despite my nickname, I'm probably going to be using C# and XNA for so I'm on the hunt for up to date (and most importantly available - the links provided above are dead) bindings. On a slightly different, but not unrelated subject... NightRadio... do you have any detailed information available about the usage of the parameters in the various functions that make up the SunVox library interface? At the moment, I'm interested mainly in the routines to initialise the library, open songs and play them. Do you have any place on the site here for documentation about how to use the library? I've been unable to find anything so my attempts to use it have been a bit hit and miss. If you've not got anywhere, I'll write up my notes on my own site and then link them here. do you have any detailed information available about the usage of the parameters in the various functions that make up the SunVox library interface? There is some information in the sunvox.h, but i still have no time to make it better, sorry... Please ask any questions here, i will try to help you as soon as possible. Download link fixed. Sorry for the delay! I'll try to update the binding so it supports the latest libSunVox one of the upcoming weeks. It would be amazing if I could somehow read the amplitude half a second ahead in time so the game would have ample time to work out the response. Although, I noticed that on some computers the instrument events don't seem to fire... I'll have a look at this and upload v2.1 as soon as I figure out why! EDIT: Looks like depending on the module scopes for event info doesn't really work that well... 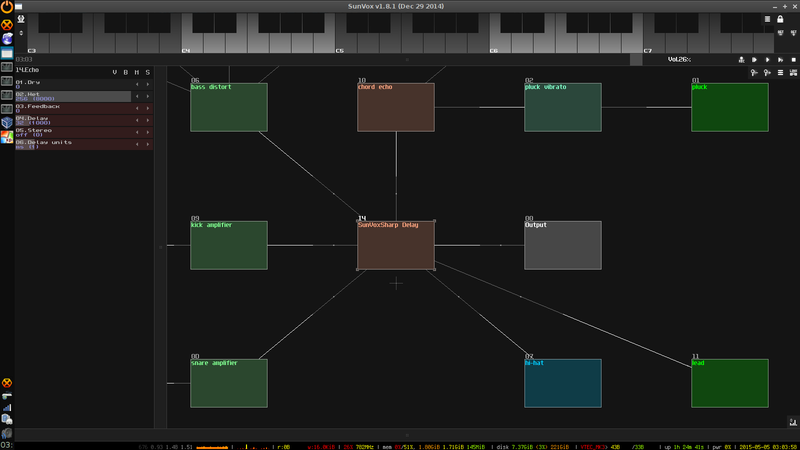 Version 2.1 is tuned for instruments that are especially made to be detected by libSunVox, like the bottom left ones in gcc.sunvox (12 and 13). These don't have to be connected to an output chain, so just use a multisynth ...but for some reason, in particular on an old WinXP machine it misses events that are fired in quick succession. Eventually I might redo the event stuff based on sv_get_pattern_data or something, but hopefully this is still useful as it is. Is there a way to get SunVoxPlayer to work with the latest sunvox.dll?